New York String Orchestra Seminar Celebrates 50 Years | Kirshbaum Associates Inc. Established in 1969 by prominent New York arts administrator and artist manager, Frank Salomon, the New York String Orchestra Seminar, under the auspices of The New School’s Mannes School of Music, will celebrate its 50th year as one of the most important conservatory-level training programs in the world in December 2018. 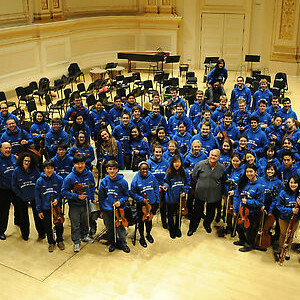 Created for the legendary musician, Alexander “Sasha” Schneider, the New York String Orchestra Seminar has been a launching point for countless young musicians as they bridge the gap between their student years and the very early stages of their careers, with over 2,300 notable alumni actively performing extensively as soloists and in nearly every major orchestra and chamber ensemble in the United States.